Today is my birthday and I got the second most exciting present ever. The first most exciting present arrived 4 years ago in the shape of my first ever insulin pump. What a fabulous bit of kit. You can keep your iphones, laptops, satnavs and other gizmos. For me, the most life-changingly, health improvingly, fabulous gadget in the world is a combined insulin pump and CGM. The only downside to it is the lack of ability to play Tetris on it. If it could do that, I’d be beyond delirious. So what comes second only to that I hear you ask? A brand spanking new insulin pump and CGM, that’s what. 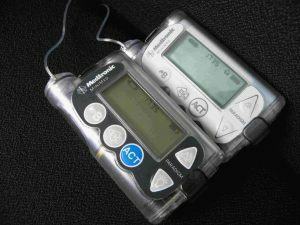 My beloved (if stroppy) Medtronic Paradigm is being gracefully retired, to be replaced by its younger sibling, the Medtronic Paradigm Veo. I didn’t have my heart set on keeping it in the family. I looked around at what else was out there but when my number one criteria is a pump with integrated CGM and no one else has one on the market yet, it was a pretty simple choice. I’ve decided to follow the same naming theme when it comes to the new pump, so like the old pump it will be known as “my pump”. Diabetes is complex enough, where I can I like to keep it simple. Getting a new pump does have its downsides. You suddenly realise quite how grubby the old one is for a start. It’s really pretty grim. Beyond basic hygiene though, the real eye opener is how much of the pump stuff I do every day on autopilot. Getting a new pump – even one from the same company so any changes are pretty minor – is a bit like getting a new mobile phone. Things have been moved around slightly and some bits have been renamed. The changes aren’t that major, I managed to set the thing up in true Alison style by not even opening the instruction book (of course, only an idiot would do this, if you choose to set your insulin pump up without reading every last word in the instruction book don’t come crying to me when it all goes wrong!). The differences just mean that you have to stop and think about what you’re doing, but I think I’ll be back to normal in a day or so. My first step was to stop the damn thing beeping every time I pressed a button. I hate the beeps, they make me feel like I’ve put a week-load of groceries through a supermarket checkout whenever I consult the bolus wizard. Changing that and all the alarms to vibrate ensured some peace and quiet while I tranferred all my settings from old to new. Once the basics were up and running, I did venture into the instruction book to suss out the new functions on the Veo that it’s older sibling lacked. It has smaller basal rate increments which is nice – although the 0.025 increments are only available on basal rates below 1u/h. Where my basals are above that level, the increments are only 0.05u/h. I would have liked the 0.025 to be available through the entire basal spectrum, but like Tetris, that appears to be just a dream. I did get disproportionately excited to discover that I can now see what insulin I have on board at the touch of one button, rather than having to go through the bolus wizard to find it. That’s a nice touch which makes life a little easier. The ability to set different target blood sugars for different times of the day is pretty cool. That means you can choose to aim to be a 5 during the day but perhaps increase that target to 6 overnight as a middle-of-the-night–hypo-avoidance safety net. And you can set different carb ratios for different times of the day so if like me you need more insulin for 10g of carbs in the morning than you do in the evening, you no longer have to manually add a bit on to what the bolus wizard recommends. Such simple stuff, but so nice to have. From a CGM perspective things seem to have moved on quite a bit. It now has predictive alerts so it can alarm to tell me when my blood sugar is rising or falling particularly quickly or if it thinks I’m going to breach my high/low limit within the next 30 mins – that’s quite an exciting concept, I’m yet to be convinced the alarms won’t do my head in within days, but we’ll see. One particularly attractive feature is that I can programme the pump so that if I fail to react to a low alarm below a certain level, the pump will suspend insulin delivery for two hours. While I (touch wood) no longer have major problems with overnight hypos since starting on the pump, it will still be a nice little safety net for when I travel for business and am alone in a hotel room overnight. What sent me running for the instruction book was the fact that my 24hr CGM graph had disappeared, I could only find the last 3 hours of data which is useless when I wake in a morning and want to see what’s been going on all night. Panic over, with the press of a button I can now see 3, 6, 12 and 24hr glucose reading graphs. The pump will also calculate how much time I spend per day out of my preferred BG range which previously was only available by downloading the data onto my PC. As that happened at a similar frequency to the Olympics, in reality I never had that data. Now I do! So, I’ll put the old pump away in a cupboard somewhere and thank it for 4 year’s loyal service. I’ll also apologise for the near permanent concussion it’s lived with due to many collisions with doors, floors and other hard things. I’d like to promise the new one that it will have a better life, but I don’t think that would be very truthful! Happy birthday co-writer! Oh yeah, good article too. Have a most wonderfully happy birthday Alison and I hope the day is as fantastic with you as it is here. Just wondering how you managed to get funding for CGM? Happy birthday Alison! I had to take mine back this morning, boy was I sad, it has been very helpful – particularly those ‘your blood sugar is rising/falling quickly’ arrows! Even with my very unpredictable control I didn’t get fed up with the alarms, it seems a lot better than the separate CGM I borrowed last time for that. Oh! I phoned Medtronic and the ‘prime’ bit is now called ‘fill cannula’. In other words, they’ve lost that function as you can use ‘fill cannula’ to do the same thing. Just in case you get any bubbles! Oh, I never thought of using that – I had a bubble today and I just shoved through a big bolus to get rid of it. I was worried, doing a test run as it were, that the machine wouldn’t be giving me the correct corrections etc and it would presume more insulin was on board. Indeed – that’s the problem with doing what I did! I had to manually calculate my insulin on board. Nightmare! Happy birthday, Alison. Did the pump arrive gift-wrapped? Thanks for all the birthday wishes. I’m having a lovely day now that work is over. Sadly Medtronic didn’t gift wrap my new pump, but my new Enlite sensors have just arrived so that’s a nice little bonus! 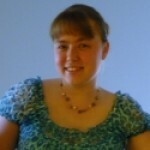 @alison – did you know you shared your bithday with AmyT @ DiabetesMine http://www.diabetesmine.com/2011/04/happy-birthday-amyt.html? Is that just coincidence or is there something about April21 that produces opinionated (in a good way 🙂 ) women with T1? Hmm. Do I need to warn my sister to watch out for my niece (whose birthday was also 21 April) who definitely fufills the opinionated side of things (as any relative of a 10 yr old with a highly evolved sarcastic sense of humour will vouch for, I’m sure)? @nigho I discovered that a couple of years ago, and then this year I discovered that @pattidevans who runs a fabulous set of diabetes support forums – second only to ShootUp in their fabulousness 😉 – was also born on this auspicious day. Add that to it also being the birthday of the Queen and I think there is definitely something about an April 21 birth! @annette I’d like to think its inevitable your niece will be gobby, opinionated and sarcastic due to her birth date, but her chosen subject about which she is so opinionated could be anything, therefore you shouldn’t fear for her pancreas too much! I’m wondering – are there studies out there in internet land on second degree genetic links? (ie the situation between me and my siblings kids) Or does that familial distance return their risk factor to that of the general population? 21 April is also my mum’s birthday! Read into that what you may. Happy belated birthday! Hurrah for CGMSs! Boluses are like.. bonus doses of short acting insulin to immediately compensate for food / changes in bgls, while long acting insulin does the background work, right? So why is it not the case that one can just have their cake and bolus for it? But aren’t you all pros at calculation? Oh well, I know there are 574395734 factors at work. The latter point stills stands. 🙂 Thanks for replying. A very belated Happy Birdy @alison.